For the places where lightning is a constant darn near everyday occurance, like Florida, you can take this blimp up where they will fly around the nearest thunderhead and hang in the sky as you see spires of color shoot 50 miles high through large picturesque windows. Guests will also be treated to the scene of a thunderhead lighting up due to internal lightning. Sure to be a great dinner cruise experience. If it's safe, sign me up! Surely the Cuban skies would be more enlightening. Yes, but then Daseva wouldn't go on it, come to think of it, nor would I. Oh yes that would be some nice fireworks directed at the craft. Yes it is safe. You are in a craft that isn't grounded. What if someone snuck a Wimshurst machine onboard though or communist propaganda and everyone read it and there was a mutiny and a forced landing in the big C? This idea's gonna fall like a lead zepplin. Then again, with some Gattling guns mounted at the nose, tail and amidships; an attack could be held off for a while but like the attack on the Alamo; you know she's gonna fall eventually. The only way up from there is Stairway to Heaven. It's 10 pm pacific time and the phantom 'bakery pirate galeon swoops across the China Sea about now. 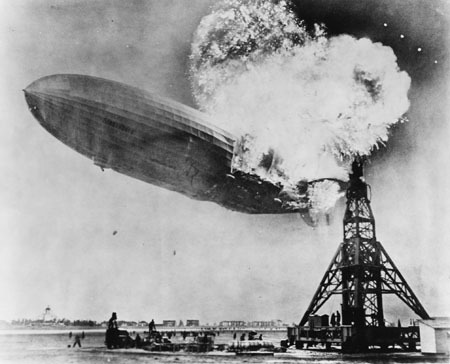 The hindenburg was not felled by lightning and the latest studies done show that the burning you see was from the flammable outer shell mostly. Sounds like fun to me. Only I think it will be safe because an airplane is a cage of faraday, regardless of wether it is grounded or not.